No summer vacation to ​​Florida is complete without catching at least one fireworks show. 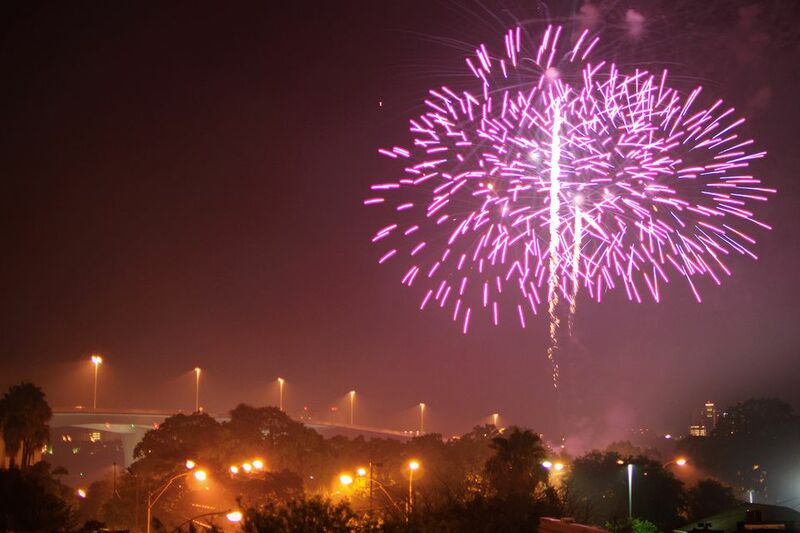 For the Fourth of July, the city of Tampa celebrated the birth of America with a variety of special events, concerts, and pyrotechnic displays. Surrounding communities, beach resorts, and even an amusement park provide plenty of entertainment on Independence Day. About 22 miles west of Tampa across the West Courtney Campbell Causeway, the city of Clearwater celebrates Independence Day with the largest fireworks show in the Tampa Bay area. The event takes place at Coachman Park, and the gates open in the early afternoon. Along with performances by the Coachman Park Pops Orchestra, you can enjoy an afternoon of food, drinks, local vendors, and family-friendly activities before the firework show starts at dusk. The downtown Tampa July 4th fireworks display has traditionally been held at Channelside Bay Plaza. It recently relocated to the harbor in front of the Tampa Convention Center. Other areas with a view of the harbor made ideal places to enjoy the event. Fireworks viewing was available along the Tampa Riverwalk adjacent to the Tampa Convention Center as well as from nearby restaurants such as The Sail; Jackson's Bistro, Bar and Sushi; American Social Tampa; and the Tampa Marriott Waterside Hotel and Marina. The Busch Gardens amusement park has a special Independence Day event planned for July 4, when fireworks will light up the sky accompanied by a new patriotic medley. You can spend the whole holiday enjoying one of the many thrill rides, including the family spin coaster Cobra's Curse, or you could dance the day away at one of the DJ party zones in the park. Either way, your admission price will get you up-close access to the fireworks, or you could just show up to the parking lot around dusk and watch from there (though you may be charged for parking). The waterfront in downtown St. Petersburg hosts the city's Fourth of July fireworks celebration starting with live music at North Straub Park. As the main attraction, the fireworks can start as 8:30 p.m. but can start as late as 10 p.m. depending on the weather. You can view the show along Bayshore Drive in city parks including Albert Whitted, North Straub, South Straub, North Shore, Elva Rouse, and Flora Wylie. Located on the southeast corner of St. Petersburg, the community of Gulfport also hosts a day-long celebration in honor of the holiday. Family activities at the downtown waterfront district include a fishing derby, a parade, and a sand sculpture contest as well as a market for produce, arts, and crafts. The event ends with a fireworks show over the Boca Ciega Bay Aquatic Preserve. Further southeast on the coast of the Gulf of Mexico, you can also catch a small community fireworks show at St. Pete Beach Access Park, which starts at dusk. About an hour south of Tampa, the city of Siesta Key puts on its annual fireworks show over the Gulf of Mexico. Siesta Beach was rated as the Number One Beach by TripAdvisor and AARP in 2015 and Dr. Beach in 2011, making it one of the most picturesque locations to see fireworks in the Tampa Bay area. The annual community event is entirely sponsored by public donations and proceeds from the Siesta Key Beach Concessions. While there are many places along the beach to catch the display, buying tickets for access to the VIP viewing area not only supports the event, but you also get preferred seating and complimentary drinks and snacks. Safety Harbor's annual Independence Day celebrations will take place at various venues around the city, but the best places to view the fireworks show are at Waterfront Park or the marina itself. Starting off with Fourth of July bike decorating in the morning at the John Wilson Park and Gazebo, festivities continue with the parade down Main Street led by the American Legion Auxiliary. Later that evening, the Safety Harbor Marina hosts the annual celebration event featuring children's activities, live entertainment, food, and fun for the whole family followed by a fireworks display over Tampa Bay.